When we were young, having a clean home meant having that “clean house” scent. You know the lemony-fresh smell of Pine-Sol, the eye-watering fragrance of bleach, and the ever-intoxicating aroma of artificial air fresheners? Well, today, we know that there’s a better way to be clean, and it’s all about being green—from the products we use to the way we rid our home of clutter. We’re mindful of the labels on our food, as we watch out for sneaky sugar, GMOs, and preservatives. But we’ve become a little blasé when it comes to our attention to detail for the products we use in our homes. Just because you’re not consuming household cleaners does not mean your body isn’t absorbing these chemicals—whether it’s through your lungs or your skin microbiome! Drain cleaners, oven cleaners, and acidic toilet bowl cleaners are some of the most toxic ingredients in our homes, releasing harmful chemicals in the air and disrupting our endocrine system in the process. Check out these tips to help protect your family, preserve our planet, and make this seasonal tradition a green habit you can take with you throughout the year. The easiest way to eliminate toxic chemicals is to stop them before they ever enter your home. Every green-cleaner should have these essentials stashed away to make a DIY concoction in a flash. Lemon Juice is a natural bleaching agent and stain remover. 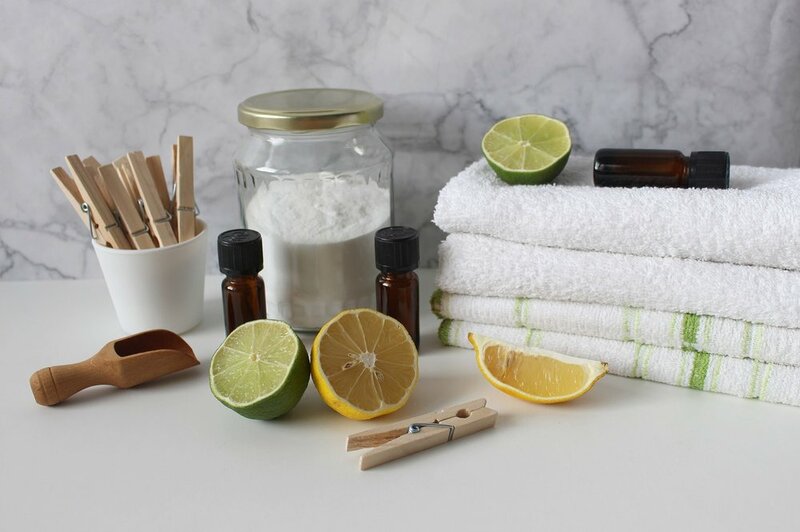 When making DIY recipes with vinegar, lemon also helps to neutralize the scent. Perfect for: cleaning glass, degreasing ovens, minimizing rust, eliminating ants! Castile Soap is an all-purpose foaming cleanser for those times when you really need to give your home that squeaky clean feel. A truly green castile soap should only have three ingredients: lye, distilled water, and oil! Perfect for: everything! From hand soap to face wash, castile soap has endless uses. Baking Soda is sodium bicarbonate that reacts with both acids and bases. When activated with acids like lemon & vinegar, it causes dirt and grease to dissolve in water. Perfect for: deodorizing, removing tough-stains, lifting stubborn grime! White Vinegar is the go-to essential for all DIY creations. It’s cheap and safe, yet strong enough to get the job done. Perfect for: your dishwasher, cleaning tiles & grout, removing smelly stains from clothing, killing weeds, and so much more! Olive Oil naturally picks up dirt and polishes wood. Like dissolves like, so if you’re looking for an all-natural product to lift grime, olive oil is a fantastic choice. Perfect for: shining stainless steel & cutlery, removing water rings on wood, conditioning leather furniture. Laundry day is something that plagues every household. And if you’re guilty of letting your clean clothes sit in the dryer for days before you fold them, I won’t tell anyone. However, there are a few ways you can lighten the load for our planet. Microfibers from our synthetic clothes end up in our waterways, harming the animals that live there. To prevent these microplastics from polluting our sacred water sources, use a scientifically approved mesh laundry bag to help trap those pesky threads. Always wash your clothes in cold water. Hot temperatures break down your pieces and because cotton is one of the most toxic crops to grow, a little care for our clothing goes a long way in protecting our planet. Skip the machine and get your hands wet. I know what you’re thinking, with your busy schedule, how are you going to find time to hand-wash your clothes? Well, try starting with your delicates! Put on a good playlist, be mindful of your work, and gently hand wash your pieces. Finally, hang them up to dry on your patio or near a window. This is the simplest way to preserve resources and help our planet. Ditch the plastic bottles and opt for a detergent that comes in a cardboard box. Avoid bleach and any detergent that’s laden with sulfates, dioxane, nonylphenol ethoxylates, benzyl acetate, dyes, and artificial fragrances. It just takes a little bit of effort and research to transform our habits—to better our health and help our planet. And after all, don’t you think we’re all worth it? The sun is shining, and spring is here. Are you ready to get your home in shape? Drop your favorite green-hacks below to help us out this season!